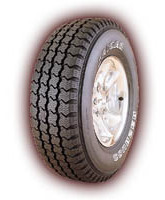 This workhorse of a tire is our best-selling all-terrain light truck tire in P-metric sizes for the perfect replacement application on pickups, vans, and SUV's. Steel cord belts over a polyester cord body form a durable tire carcass. The rigidity of steel cord belts contributes to the tire's fuel economy and solid performance.